I was looking for some classic game soundtracks and they don't get as much classic as Frank Klepacki, so I managed to grab myself a copy of the C&C: Tiberian Sun soundtrack. While I didn't really like this soundtrack when it first came out, I must admit, it has grown on me. This is a pretty good soundtrack. Just about all the tracks are pretty awesome in their own right. 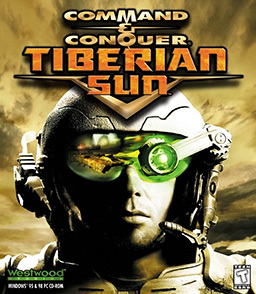 Just like with any of the old C&C games, the Tiberian Sun soundtrack is chock-full of Frank Klepacki's trademark industrial music, whether it be industrial dance, industrial drum 'n' bass or even industrial rock. I've got a lot of favourites, so it's hard to isolate a few to talk about but old favourites for me would definitely be Lone Trooper and Scouting. Why these tracks? If I recall correctly, these tracks were unique to the GDI side and yes I'm a GDI fan from way back (yeah, yeah, I'm a goodie-two shoes). Lone Trooper to me symbolises the heroism of the GDI forces against insurmountable odds - it's also a very catchy tune. Scouting on the other hand is one of the more upbeat, fun tracks on the Tiberian Sun soundtrack. I love the syncopated rhythms in this and it just gets me tapping my feet everytime I listen to it :) (hey there's even a remix for it)! Other good tracks are the drum 'n' bass track Flurry, Mutants (to which you could almost imagine mutants shambling along to the track), Mad Rap (which sounds like a spiritual predecessor to Red Alert 2's "Jank"), Valves (which always reminds me of GDI's slow, metal behemoths), What Lurks (has an awesome James-Bond-like bass riff later on) and Score. The price for this game was reasonable but you're missing out on some tracks. The one that definitely comes to mind is one of my favourites, NOD Crush, I mean, how could they miss this beauty? 16 Tracks is a decent amount for an ordinary album, but when you compare this soundtrack length to some of the competition, it's a bit lacking. For those interested in obtaining this album, you can get it off Big Pond Music.